Thank you to Basic Fun and Just Play Toys for providing samples for my review. All thoughts are my own. Do you have a Disney Junior fan in your house? 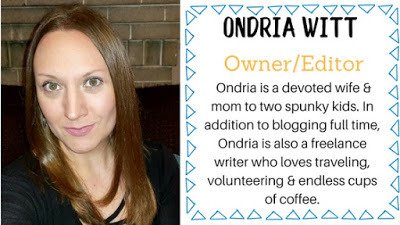 When my son was a toddler, we watched a lot of Disney Junior shows, and we both wound up falling in love with the characters. Over the years, my son has grown up a bit (he's now eight years old), but my daughter is discovering some of those same Disney Junior shows and characters that her brother loved so much, and meeting some new ones, as well! 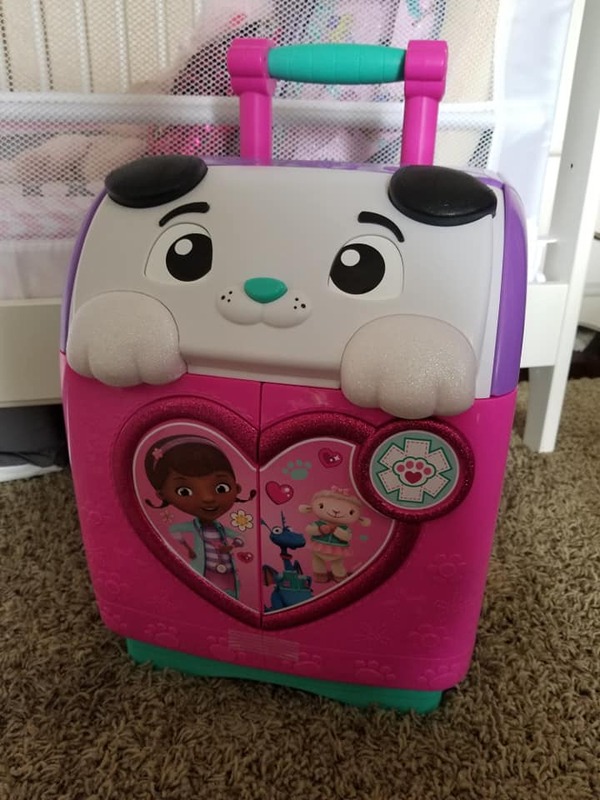 As we've talked about Christmas and holiday wish lists, my daughter has been quick to point out fun toys and games with her favorite Disney Junior characters on them. 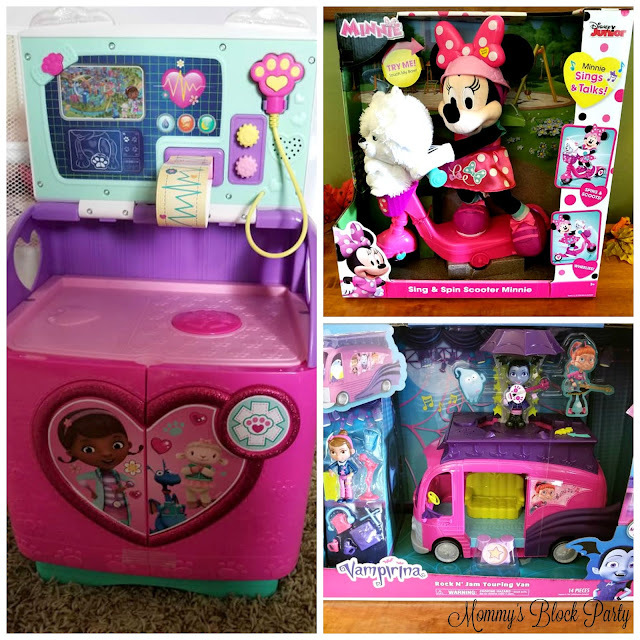 Minnie, Doc & Vampirina: Oh, my! When it comes to gifting holiday toys, there are always those toys that are viewed as 'hot holiday toys,' and I am so excited to show you three toys that feature classic and Disney Junior characters, and are going to be highly sought after this holiday season! All three of these toys are perfect for toddlers and preschoolers on up. 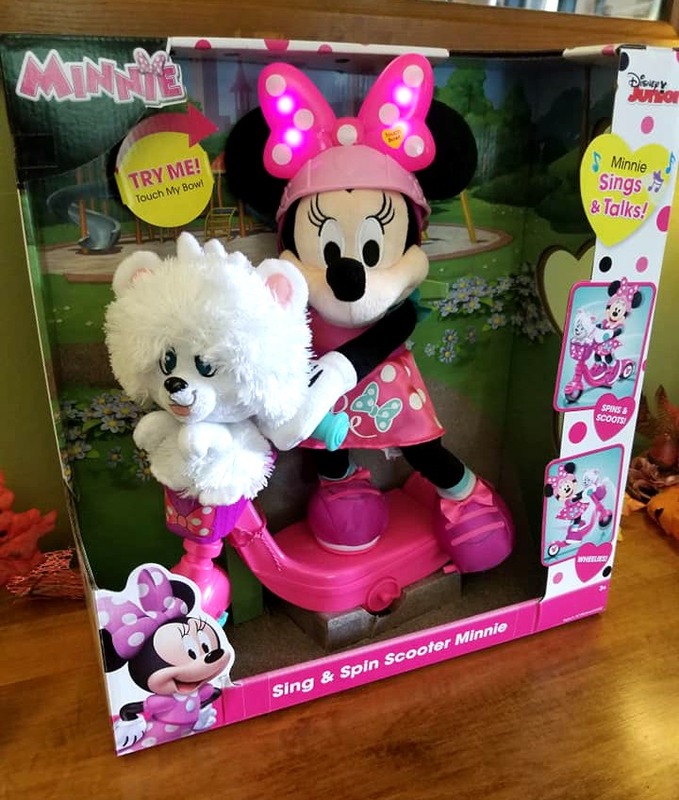 The Sing & Spin Scooter Minnie is a must-have for any mini Minnie fan! I have to say that my daughter's first character love and obsession was with Minnie Mouse. Last year, she had a very Minnie Christmas. We have a lot of Minnie plush dolls, toys, and more in our house, and as Bean heads toward age 3, she's outgrowing a lot of her baby and early toddler toys. She's ready for more bells and whistles, and lots of fun and interaction. Sing & Spin Scooter Minnie is loads of fun! This toy features a little scooter with a soft Minnie figure. Minnie 'rides' her scooter when you press the button on her bow, which makes the scooter spin while Minnie sings. Her bow also lights up! She has an adorable little pup riding along in her scooter basket, too! 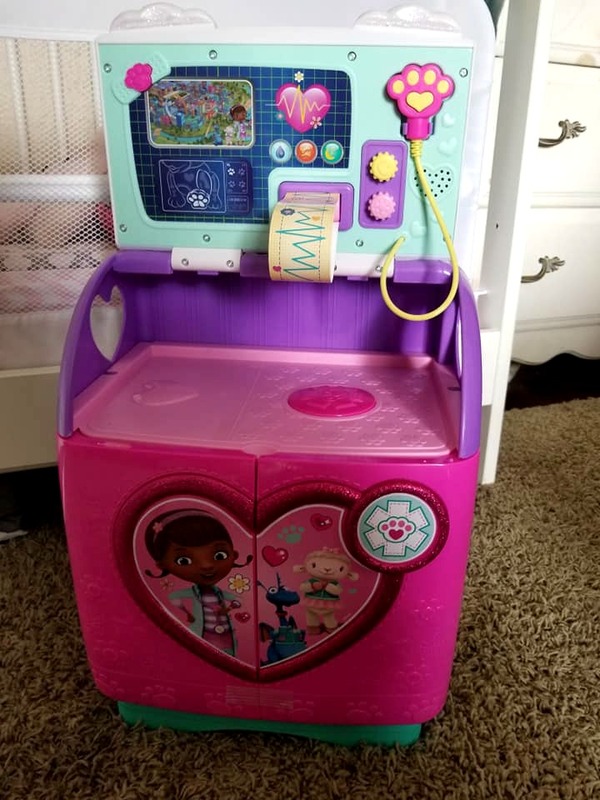 I love this toy because it's one of those fun toys that does everything kids want- it sings, plays music, spins, lights up, but it doesn't take up a ton of room! This is like a dream come true! Minnie really scoots and sings! Tap her bow to activate movement and sound. Minnie really scoots, twists, pops wheelies and does 360° spins! Minnie sings an upbeat song and her bow lights up! Available at Amazon, Walmart, Target, Kmart. Vampirina Fun for Your Ghoulish One! 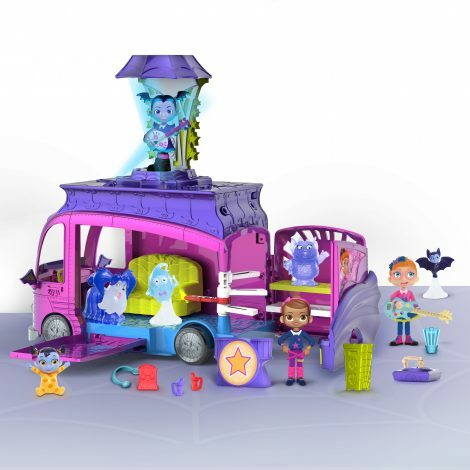 Another hot, hot, hot toy for the holidays is this awesome Vampirina Rock N' Jam Touring Van set! Vampirina is one of Disney Junior's newer shows and characters, and Little Bean absolutely loves her! She loves to see Vampirina with her band, The Ghoul Girls, just having fun and rockin' out! Bean loves music, so this toy is both fun to play with, and inspirational. The toy set includes 14 pieces, including a tour van that really rolls! The van opens up, featuring tons of ways to play with the included characters and play pieces. The band girls can practice, take a spin on the road, and put on a rockin' performance! 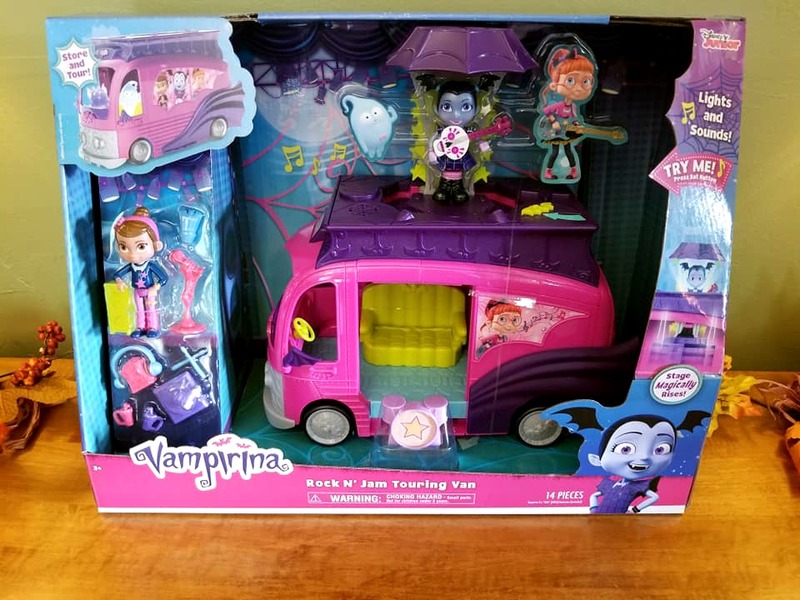 The van 'talks,' including phrases from Vampirina, and more! It also lights up, and plays cool rock music to enjoy. This cool toy will provide hours of fun and imaginative play for your little one! Van really rolls and opens to transform into rock star lounge with driver's seat/couch, bunk beds and piano stairs. Press bat shaped button on top of the van to activate lights and music and watch Vampirina magically rise on her performance stage! Plays the "Living the Scream" song from the show! Set includes Rock N' Jam Touring Van, Vampirina figure, Poppy figure, drum stand and drumsticks, record player, standing microphone, speaker, headphones, Vampirina's spookylele, award, popcorn bag and two cups. Available at Amazon, Target, Walmart, Kmart. The Doc McStuffins Mobile Pet Rescue Clinic is perfect for fun at home or on the go! Both of my kids love Doc McStuffins. Even I have a soft spot for the sweet girl who loves to take care of toys, pets, and friends. This little Mobile Pet Rescue Clinic is so much fun! 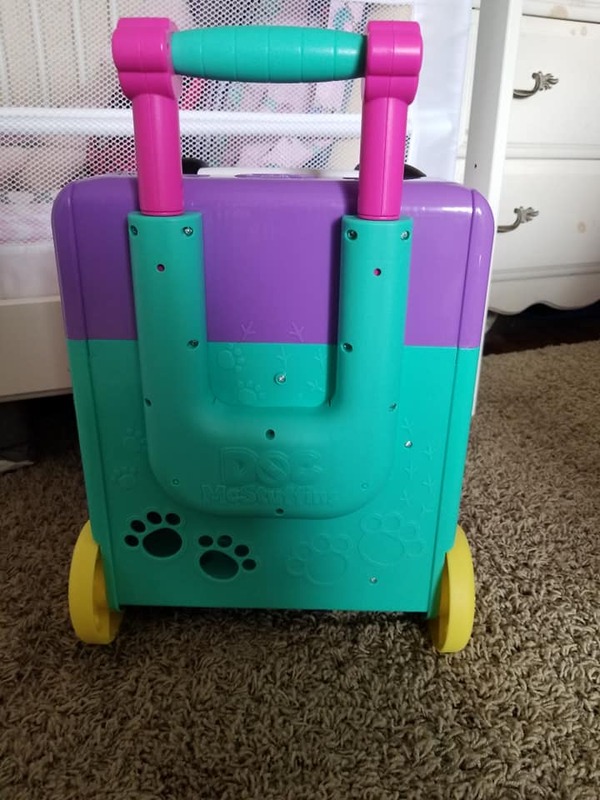 It looks like a sweet little suitcase, with a pull up handle, and wheels for rolling fun! When the toy is stationary, it opens up to reveal a mobile care center for little rescue animals! This rolling play center is perfect for at home playtime or playtime on the go! Open it up to reveal the care center! This is such a fun toy! When you open it up, a whole mobile care center is revealed and ready for playtime. 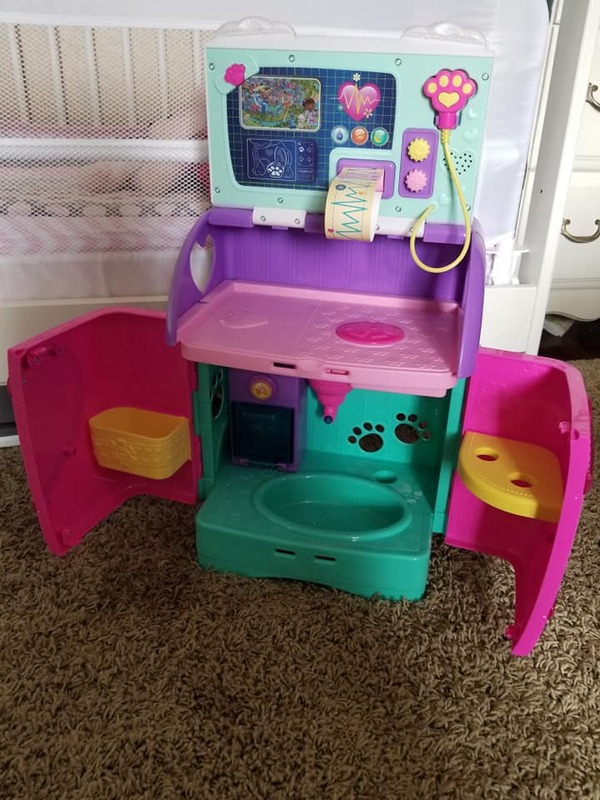 On the top, your child can play with the computer screen, checking the pet's vitals, and heartbeat. On the bottom portion and sides, there are places to store play instruments, charts, and to house the rescue pet being checked. The set also comes with a tiny pup pal for your child to love and care for. When playtime is over, close it up for easy storage! This toy folds right up for easy storage so you can put it away until your child is ready to play with it again. It is easy for a child to roll if they want to move it from place to place. We're going to be traveling after Christmas, and I'm excited to be able to bring this mobile clinic along for Little Bean to play with. It can easily slide right under the seat in the car, and take up virtually no space while we're traveling. Light and sounds control panel help kids locate toy pets in need. Light up x-ray and talking stethoscope helps diagnose boo-boos. Give Oliver a bath and help him feel better with play treats! Fold up the mobile, lift the handle, and roll on the go. 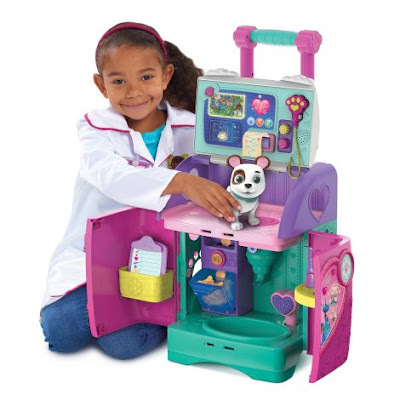 Pet Rescue Mobile comes with lights, sounds, music and play medical tools and accessories. I love all three of these cute toys, and think that they're just perfect gift choices for the holidays. If you have little girls (or boys) who love these characters from Disney Junior, don't forget about these three gifts! In fact, you might want to pin this to your holiday gift idea board, if you have one! There are so many more fun toys for kids available from Just Play! Be sure to check them out for even more cool gift ideas for kids of all ages! You can also find lots of other cool toys and games over at Basic Fun. Connect with Just Play on Facebook. Connect with Basic Fun on Facebook. Special thanks to Basic Fun and Just Play for allowing me to share about these sweet holiday gifts for kids! Be sure to look for them in our 2018 Holiday Gift Guide! Which of these cute toys do you think your little one would love to find wrapped up under the tree this year? Oh my! These look like fun toys for the little ones! Perfect for any Disney Jr. fans! These are such fun toys that my nieces would really enjoy!